Safe Spectrum, by Promolux Lighting International, represents the culmination of thirty-plus years of lighting design and research for the advancement of food-safe lighting for the food retail industry. 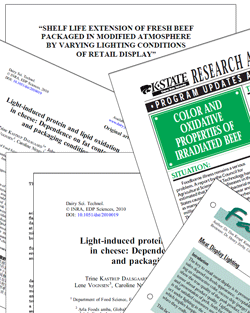 Years of research by renowned international food science laboratories, universities and dozens of field trials has lead to engineering of a food specific light source that is safe to use in all types of fresh food display cases. Science and research have proven that foods break down at a chemical and cellular level when exposed to varying levels of radition both in the form of heat and light (visible and non-visible radiation). Increased Food Safety - lower surface temperatures lead to reduced pathogen growth. Improved Shelf Life & Quality - nutritional integrity, natural juices and moisture content and flavor are sustained. Superior Merchandising - balancing of the lamps spectrum provides unparalleled color presentation for retail food displays. Display lighting causes surface heating and promotes photochemical processes that contribute to discoloration, oxidation and food borne pathogen growth. Perishable foods and merchandise that are sensitive to heat and light significantly benefit from being displayed under lights like PROMOLUX, which incorporate Safe Spectrum science and technology. Designed to reduce levels of visible and invisible spectra PROMOLUX is the safest, most cost-effective and sustainable lighting solution for food displays. As pioneers in the field of food display lighting, Promolux Lighting International is pleased to present this educational portal on the science of food and food lighting. Here you will find years of scientific studies, research papers and industry reports on the impact lighting has on specific foods. Whether you are a retailer, lighting specialist, university student or food science professional, we invite you to review the existing research and facts and encourage you to help build this site as an educational resource on the science of food and lighting. 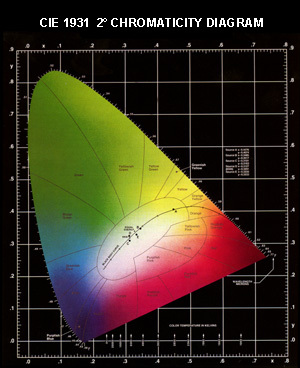 Every wavelength of light is perceived as a spectral color and certain spectral wavelengths affect the chemical composition of foods.